Dan Kitchener aka DANK is a British artist whose work has a gritty urban theme, taken from everyday life and the surroundings and environment he experiences daily. In his work he uses a variety of mediums, spray paint, paint markers, stencils and paint for canvases. He also produces a lot of digital paintings and illustrations which again follow similar themes, lonely urban landscapes punctuated by flickering, faulty street lights, high rise flats rising from misty horizons over concrete grey skies. Born in 1974 in Essex, DANK has diploma in GCSE art and earned his degree BA Hons in Art from Portsmouth University, fine art / illustration course. Kitchener started painting streets when he was teenager, trying out tagging, copying the New York style graffiti he saw on TV and in books from the local library. Without much success, but with the tools available, Halfords car spray paint, he couldn’t achieve the level of work he wanted to, and so he put graffiti on the back burner in favor of other techniques. 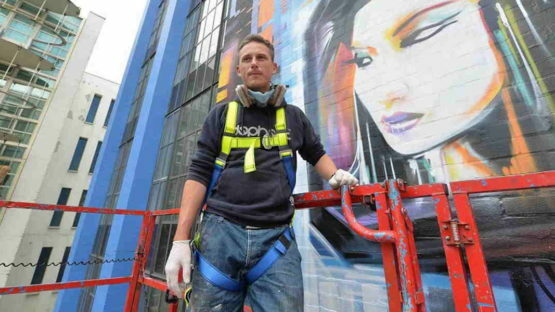 But then, he picked up a can again with renewed enthusiasm and confidence and began his journey that last for over 10 years using the spray can to express himself on huge walls all over the world. DANK has respect for so many artists, he particularly loves artists with good strong drawing backgrounds. For DANK art needs to challenge and progress, not replicate, duplicate and stagnate. DANK worked for some major clients, including Sir Paul McCartney, Kylie, Calvin Harris, Il Divo, Carlsberg, MTV, ITV, Ministry Of Sound to name a few, exhibited artwork all over the world and sold to a growing body of avid collectors from Australia, Japan, America, and all over Europe. DANK lives and works in London, UK.